As parents, we keep track of almost all the milestones our children cross – especially when it comes to height and weight. Sometimes we tend to overlook some important skills like fine motor skills and hand-eye coordination. We must ask ourselves if we are giving enough importance to the development of our children’s hand-eye coordination? Shouldn’t we be doing more? Before we dig into what kind of games or toys help in improving hand-eye coordination, let’s explore the benefits of this skill. Hand-eye coordination is the ability to track hand movements with the eyes. This enables the eyes to send useful signals to the brain regarding hand movements. Lack of proper hand-eye coordination can affect everyday tasks such as writing, exercising and so on. Hand-eye coordination is crucial for a child’s development as it is known for playing a vital role in a child’s learning experience. How Does Hand-Eye Coordination Affect Motor Skills? There are two major types of motor skills – Gross motor skills and Fine motor skills. Activities such as driving, catching a ball, swinging a golf club, etc. are gross motor skills. These gross motor skills frequently require hand-eye coordination for people to have good reflexes and fast reaction times. The minuscule movements in our muscles that are usually in the hands and wrists are called fine motor skills and these are significantly affected by hand-eye coordination. Activities such as tying shoelaces, holding a spoon, holding a pen, etc fall under this category. Lacking hand-eye coordination can deprive your child of carrying out basic but important activities and the skill-set required to handle everyday chores. Helping your child improve their hand-eye coordination can result in a huge change as they grow up. The little efforts you put in today could even carve the path of a sportsman or a surgeon for them in the future. Here are some interactive toys and educational puzzles which you can use as a starting step. Wooden puzzles are great for kids. Not only are they colourful but they are great to teach kids about shapes and patterns. Buy giant wooden floor puzzles with large pieces so that your toddler doesn’t accidently swallow them. Stacker toys can he extremely helpful in encouraging hand-eye coordination. One mistake and the tower falls!! Children can spend hours doing this enjoyable activity. Stacker Toys from Skillofun are very innovative and colourful. The child is expected to sort and stack 12 square blocks in four different groups. The square blocks each have circles, squares, triangles and rectangular cut-outs. Even baby ring toys are great for infants. It enhances their imagination and captivates their attention with the vibrancy of the colourful rings. The toy has five rings, and it requires the child to stack them according to their sizes with the largest ring at the bottom and the smallest on the top. This can keep your baby engaged for hours. The stacking and combining the sizes increases curiosity which helps develop your child’s brain. Shape Sorters are a simple but effective game that teaches kids about shapes, colours, and sorting. This requires alertness and a steady grip which is enough to improve their hand-eye coordination. Not only does this toy enhance hand-eye coordination but it also teaches them basic geometric shapes and promotes creativity. Anyone who has played this game at a fair knows that this is a difficult skill to master even for adults. Set up this game in an easy manner for your kiddo and watch him beam with joy when the ring lands on the stick! Lacing toys are one of the best ways to increase your child’s hand-eye coordination. These kinds of toys usually have a thick wooden “needle” and lace which the kids have to thread through holes. These toys come in many varieties and you can choose as per your child’s interest. Some boys like lacing beads, while some girls like “stitching” a butterfly. 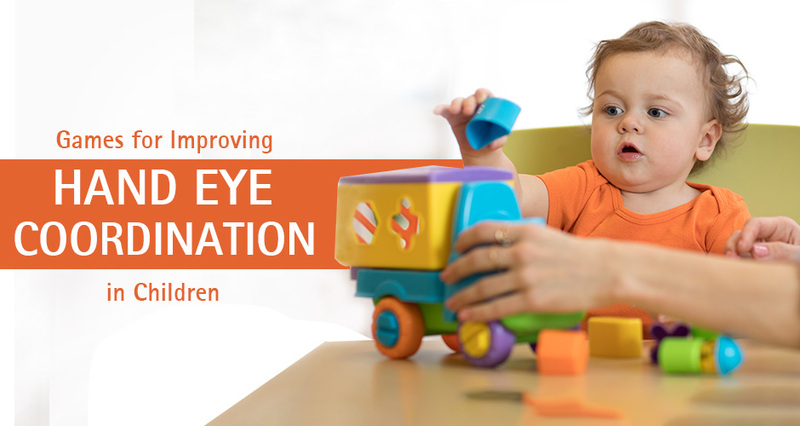 Hand-eye coordination is the foundation of all the important daily life activities for every individual. It is crucial for parents to involve children in many activities that develop hand-eye coordination. For the first three years of a child’s life, they are very active, and this is the stage where they learn a lot which contributes to their overall development. As parents, we always want to give our children the best we can. Let’s start with hand-eye coordination.